Custom filtering is a flexible mechanism for filtering RadGridView rows by using custom logic. It has a higher priority than the applied FilterDescriptors (added either by code or using the filtering row). Custom filtering is applied if user filtering is enabled using EnableFiltering or GridViewTemplate.EnableFiltering properties. By default, filtering is disabled at all levels. Replacing the RadGridView filtering mechanism by providing a custom FilterPredicate. The CustomFiltering event is fired when the custom filtering is enabled. It allows you to control whether a row is visible or not when the filtering is handled. The following example demonstrates how to hide all RadGridView rows that contain a value less than 30 for the UnitPrice column. 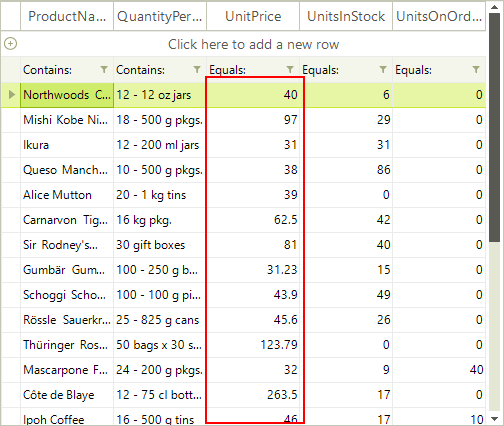 The added FilterDescriptor for the UnitPrice column in this example is not considered when defining which rows to hide. All RadGridView rows are processed from the custom logic in the CustomFiltering event handler. The following example demonstrates how you can use the Handled property of the CustomFiltering event arguments. We will hide all rows that have their UnitPrice less than "30" and ProductName not starting with "Ch". In addition, there is a FilterDescriptor that will hide rows containing values less than "1" in the UnitsInStock column. 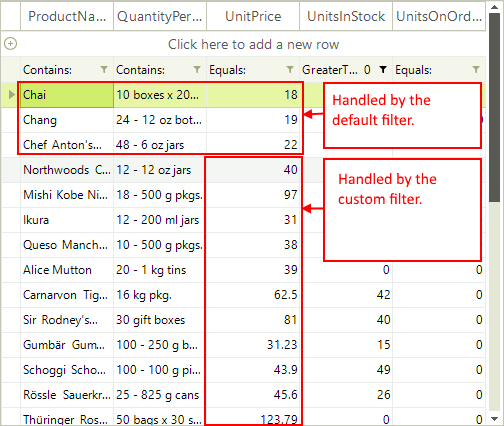 In order to determine more easily whether a row is visible or not in the CustomFiltering event when the grid is filtered by several columns, you can use the MasterTemplate.DataView.FilterEvaluate method. This method accepts a FilterDescriptor and a row as parameters and returns a boolean value indicating whether the row will be visible or not according to the passed FilterDescriptor. Thus, you can combine the custom logic for a certain column and evaluate the default one for the rest of the column's filters. You can replace the filtering mechanism in RadGridView with a custom one, by setting the FilterPredicate of the GridViewTemplate.